One of the nicest things about my new school is that for the first time, I'm teaching at a building with a library on site. I love taking my students there and looking over the titles. As I spied one book, it made me think of a scene like the one in today's contest and it brought back pleasant memories, like a friend I had forgotten. Below you will find an image of a place somewhere in the world. The winner will be the first one who can tell me where it is located. For the extra daring, try and guess the book. Or if you're just stopping by, thanks for visiting. And why not leave a suggestion today for a good book you've read. trees from Africa to me, but the tree trunk look a little thick to me. The tree is a Dracaena cinnabari if anyone is interested. 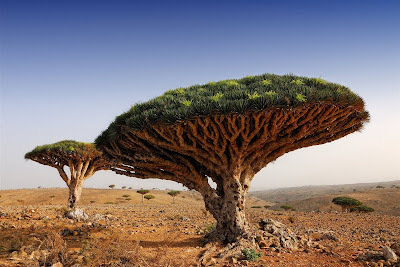 Impressive Dragon tree, fascinating island. I hope it will be spared from tourism and war. That image reminds me of Richard Dean's album covers he did for prog-rock band Yes in the 1970's. "Quo Vadis: A Narrative of the Time of Nero" by Henryk Sienkiewicz. Well, to almost all. It's not exactly light reading. This was part of the reason for the awarding of the 1905 Nobel Prize for literature to Henryk Sienkiewicz and has been made into a movie repeatedly - the movie I saw did not come close to the book's quality, I thought. Mike, yes, I can certainly see that! Virgil, thanks for the recommendation. I've seen it on TV, but never read it in print. Perhaps someday. Thanks. good not a minute of dullness. And also, the app is creating snapchatonlinelogine.com for the privacy they maintain for all the updates/features nice. Dragon Blood tree from Yemen. This is the distinctive species of Yemen island.